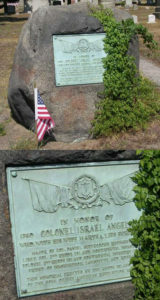 Israel Angell’s grave at the North Burial Ground in Providence, RI. This month marks the 99th anniversary of a special honor paid to a hero of the American Revolution, Rhode Island’s own Israel Angell. 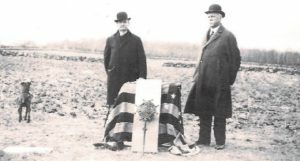 It was on Saturday, May 4, 1918 that the Rhode Island Society of the Sons of the American Revolution (RISSAR) dedicated the relocated graves of Angell and his first wife. 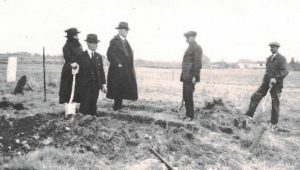 The Society had transferred the Angells’ remains a few weeks earlier from their original resting place in Johnston, RI. While we don’t have any of the colonel’s personal artifacts in the Varnum Memorial Armory Museum collection, we do have a letter from George Washington to General James Mitchell Varnum relating to Colonels Christopher Greene and Israel Angell. More on that later. Israel Angell was born in Providence on August 24, 1740, the great-grandson of Thomas Angell one of the five men who, with Roger Williams settled Rhode Island in 1636. Israel enjoyed a good education for the period (his mother had been a teacher). He had a special interest in natural history and scientific matters including astronomy. He was a relatively young 35 years old when the first shots of the Revolution were fired. Angell began his distinguished wartime career early in the war being commissioned as a major in the 11th Continental Infantry. He served at the Siege of Boston, and starting in August of 1776 spent considerable time in the Hudson River Valley of New York and in New Jersey at the Battles of Brandywine, Monmouth, Springfield, and Red Bank. After retreating across New Jersey, the unit was renamed the 2nd Rhode Island Regiment and fought at Assunpink Creek and Princeton in early January. Along the way, Angell was promoted to lieutenant colonel and eventually assumed command of the 2nd Rhode Island Regiment following the death of Colonel Daniel Hitchcock in 1777. The 2nd Rhode Island Regiment became part of a brigade under General Nathanael Greene. In September 1777, the regiment was recalled to the main army for the Philadelphia Campaign. In company with the 1st Rhode Island Regiment, Angell and his men achieved a victory over the British at Red Bank in October of 1777. Israel Angell and Christopher Greene played key roles in the victory at Red Bank as well. A letter from General Washington to James Mitchell Varnum on display in the Varnum Memorial Armory Museum (sent on October 8th) ordered the two colonels to proceed immediately to New Jersey. The Rhode Island units went back and forth between New Jersey and Rhode Island. Take a look at the narrative that accompanies the Washington Letter for additional information. Following Red Bank, Christopher Greene returned to the Ocean State to raise a unit of former slaves the so-called “Black Regiment”, which served with distinction in the Battle of Rhode Island (although the unit was never able to raise the number of African-American soldiers originally envisioned). Historian Robert Geake‘s 2016 book “From Slaves to Soldiers” is an excellent accounting of the initiative spearheaded by Greene and strongly supported by James Mitchell Varnum. Meanwhile, Angell remained with the Washington and the Continental Army during the terrible winter spanning 1777 to 1778 at Valley Forge, returning to participate with his unit at the Battle of Rhode Island. Angell kept a diary during most of his military service. Written in everyday language, he talks about mundane things like the weather, but also paints a very accurate picture of life in the military encampments. It also shows his intense interest in the welfare of his troops. For example, he wrote to the governor requesting supplies and assistance and describing the desperate state of his troops clothing, noting that some were even barefoot. Angell and his men returned to New York and New Jersey following the Rhode Island encounter. Later in 1780, Washington personally commended Angell following the Battle of Springfield for his defense of a key bridge. A monument at the Rahway Bridge in Union, New Jersey includes the text of a letter sent by Washington to Rhode Island Governor William Greene: “The gallant behavior of Col Angell’s regiment … at Springfield reflects the highest honour upon the officers and men … They disputed an important pass with so obstinate a bravery that they lost upwards of forty killed, wounded and missing before they gave up their ground to a vast superiority of force.” Nathanael Greene wrote a similar commendation. On January 1, 1781, Israel Angell retired from the Continental Army and returned to Rhode Island where he settled in Johnston, RI (and later in Smithfield, RI). During his wartime service, he was awarded gold medals from Washington and the Marquis de Lafayette. The latter medal was donated to the Rhode Island Historical Society in 1938. Although he did travel extensively around the country, Angell lived a relatively quiet peacetime life as a farmer and cooper. He also obtained a tavern license and operated a public house in Johnston, RI. It was an apparently popular place and well known for its hospitality. So, now the story moves forward to 1918. The Varnum Continentals’ own Howard V. Allen was the outgoing president of the Rhode Island Society of the Sons of the American Revolution. A yellowed typewritten and autographed text of his address to the RISSAR’s annual meeting of February 22, 1918 mentions an initiative underway to relocate Colonel Angell’s rural grave in Johnston, RI, to a place of honor in Providence, RI. Funds were voted at the meeting to support the project. 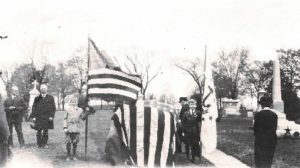 Barely two months later, on Saturday, April 20th, the RISSAR transferred the remains of Colonel Isreal Angell and his first wife, Martha, to the North Burial Ground. The story of the event was recounted in the125th Anniversary Edition of the Manual of the RISSAR. 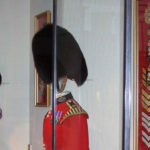 The outlines in dust only of the coffin of Col. Angell could be distinctly traced. The glass which had covered the face was found, though broken into several pieces. There were also several coffin nails, but the most careful and thorough search failed to disclose any coffin (name) plate or other metallic trimmings. The bones were removed with the greatest care and placed in a suitable box for the purpose. The condition of Mrs. Angell’s remains was much the same as that of her husband’s except that the bones were much firmer due undoubtedly to the fact that Mrs. Angell was but forty-six years old at the time of her death while the Colonel was in his ninety-second year. 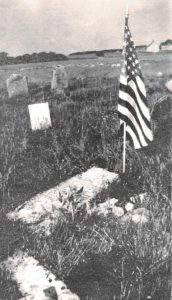 An interesting feature in connection with the remains of Mrs. Angell was the presence of several tufts of hair adhering to the skull notwithstanding the fact it had been in the grave for one hundred and thirty-five years. The original raven black color was distinctly discernible. In honor of 1740 Colonel Israel Angell 1832 who with his wife Martha A., lies buried here. Major of Col. Daniel Hitchcock’s Regiment 1775. Lieut. Colonel of 2nd R.I. Continental Infantry 1777. Colonel of 2nd R.I. Continental Infantry 1777-1781. Friend of Washington, Lafayette and Rochambeau. This monument erected by the Rhode Island Society of the Sons of the American Revolution May 4, 1918. The ceremonies concluded with the singing of “America” and the playing of “Taps”. And with that, so also ends our story for this month. Special thanks to Varnum and RISSAR member John Adams for his resources contributing to this article.